Buy the Bayer Seresto Small Dog Collar at the Cheap Pharmacy: Give your favorite companion the Seresto Collar for Small Dogs that is effective in treating ticks and fleas. It can be used for 7 to 8 months. The Bayer Seresto Small Dog Collar of the very latest generation combines 2 molecules: imidacloprid and flumethrin. Thanks to its patented polymer matrix, a true technological innovation, the diffusion of molecules takes place gradually and continuously in the lipid film. Comment on the advice of use and dosage of Seresto Collar Anti Tick Chips Small Dog Bayer with our Verified Reviews partner after your purchase in online pharmacy. Effective, this Seresto Collar for dogs allows a treatment of 7 to 8 months against ticks and fleas. It also has a larvicidal action in the immediate environment of the treated animal and resists water. Cutaneous use. A necklace per animal, to fix around the neck. Choose the collar for the animal according to its species and weight. Adjust the collar around the animal's neck without over-tightening it. The collar must be worn without interruption during the 8-month protection period. Periodically check the adjustment of the collar by adjusting it if necessary, especially in the case of kittens / puppies that grow rapidly. Animals wearing the collar should not be allowed to sleep in the same bed as their owners, especially children. Seresto is a veterinary medicine. Ask your Animal Health professional for advice. Read carefully the instructions before use. It is highly advisable to supplement your dog's flea and tick treatment with a very effective insect control product, which includes fleas at all stages of development that are present in the home. The Habitat Spray or ADVANTHOME Spray is ideal for treating specific areas, under furniture, dog basket, etc., and the Clement Tekhan Diffuser or Fogger is particularly suitable for treating the whole house, as long as the doors of the cupboards and rooms are left open. Seresto is a powerful and inexpensive antiparasitic collar long to protect dogs and cats over 7 weeks, infestations of external parasites from pets. It is active against ticks for 8 months, against fleas for 7 to 8 months depending on the conditions of use and against parasitic lice grinding. Seresto is effective against fleas , flea larvae , ticks and lice quickly and easily! 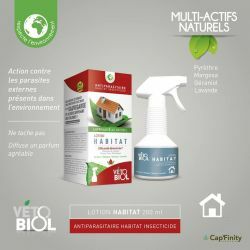 You can also order at the best price in our online French veterinary pharmacy, all complementary treatments to fight naturally against these parasites. 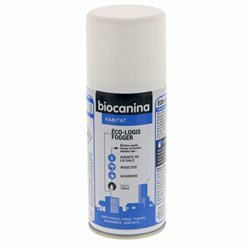 We particularly recommend flea sprays for the habitat of the vetobiol laboratory, which contains only natural and effective active ingredients. You can safely use these products in any room in your home where your dog or cat is traveling.